Want to buy a decent camera, but don't want to break the bank? The good news is that there are some cracking cameras out there if you're on a tight budget, including some great entry-level DSLRs, sleek-looking mirrorless cameras, advanced high-end compacts, bridge cameras with huge zoom lenses, not to mention travel zooms and pocket compacts. And while some of these cheap cameras may not be the latest and greatest models available right now, they still deliver the goods. We've compiled a selection of the best budget cameras going, so whether you want something to simply slot in your pocket for the odd snap that will be better pictures than your smartphone ever can, or a camera you can get a bit more creative with, you'll find it here. If you need a bit more help figuring out what kind of camera you need, then read this article: What camera should I buy? And if you want to spend a little more money, then check out our other camera buying guides at the bottom of the page. Sony's latest camera in its RX100 line, the RX100 VI, is one of our favourite compact cameras right now, but there's no getting away from the fact that it's a pricey option. The good news is that all of the previous generation models are still available at much more tempting prices. Sitting in the middle of this is the RX100 III and while it might not offer some of the latest features it's still a great compact at a bargain price. The large 1.0-inch sensor delivers excellent levels of detail, with the broad and fast range of the zoom lens making it a versatile travelling companion. There's also a built-in pop-up viewfinder and a tilting screen (though its not touch-sensitive). Take into account the sleek, premium finish and it all adds up to a great compact camera at a great price. Launched back in 2015, the Lumix FZ300 (also known as the Lumix FZ330 outside the US) it's now getting on a bit, but that makes it an even better value option as it's come down in price so much since launch. The 25-600mm zoom range offers plenty of reach, meaning you can fill the frame with your subject, no matter how far away it is. While the zoom range is pretty typical for a bridge camera, what's impressive is the constant f/2.8 maximum aperture - really useful when you're shooting at the longer end of the zoom range and helping you isolate your subject. There's also a splash-resistant body, a vari-angle touchscreen and high resolution electronic viewfinder. That's not forgetting Wi-Fi connectivity and a decent image stabilization system. A great budget buy for the novice or enthusiast photographer. Nikon's D3400 was a hugely successful and popular DSLR, and it retained plenty of appeal once the D3500 was introduced, as it managed to offer much the same thing for less money. Now, the D3500 has dropped enough in price to make it the clear best buy. Key changes over the older D3400 include a newly developed APS-C sensor (though still with 24MP) and an even better battery life of 1,550 frames per charge, next to the D3400's very capable 1,200 shots per charge. You also get a better grip and a slightly redesigned body that's a bit lighter too. The D3400 is still around and remains an excellent first-time buy, but this newer model just has a slight edge. Panasonic's Lumix ZS / TZ series of compacts has long dominated the compact travel zoom market, and that's still the case with the ZS50 (known as the TZ70 outside the US). While it may be eclipsed by its larger-sensor siblings, the ZS100 / TZ100 and ZS200 / TZ200, the ZS50 / TZ70 has the advantage of packing a huge 30x zoom into a pocket-sized body. There's even space for a (modest) electronic viewfinder, ideal for when the lighting makes it tricky to compose or review shots on the rear screen. You can use the camera like an advanced point-and-shoot compact, simply leaving it in auto for the camera to take care of settings, or you can shoot high-quality raw files, and make your own decisions about aperture and shutter speed. 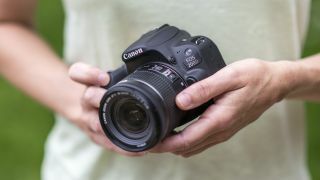 If you're on a tight budget and you can still find it, the EOS Rebel T6 (known as the EOS 1300D outside the US) is a fine option if you're just getting started. But we reckon you save you pennies and opt for the newer, slightly pricier but much better EOS Rebel SL2, also known as the EOS 200D. It gives you plenty more room to grow into as you get more confident, with the advantage of a 24MP sensor instead of a 18MP one, a wider ISO range, faster burst shooting, a flip-out LCD touchscreen and Canon's excellent Dual Pixel CMOS AF system for smooth focusing in video and live view. Video specs are stronger too and better life is better too, and it feels much nicer in the hands. Don’t let the price fool you. The A6000 costs the same as other entry-level DSLR and mirrorless cameras, but it’s an advanced and powerful camera that has only dropped to this price through being on the market since 2014. So it may be old, but most of the specification still looks pretty fresh today. This includes a 24MP sensor, a fast hybrid 179-point autofocus system and continuous shooting at 11 frames per second (fps). Its age shows in other areas, though; it only shoots 1080p Full HD video and not 4K, and the screen isn’t touch sensitive. And while it’s cheap enough, the A6000’s high-end features make it a little advanced for beginners. The D5300 was around for little more than a year before the D5500 technically replaced it, which has in turn been replaced by the D5600. It shares the same 24.2MP sensor with an identical maximum ISO25,600 sensitivity as the D5500, whilst the D5300's EXPEED 4 image processor and 39-point autofocus system have also been carried over to its replacement. Whilst the D5300 doesn't sport fancy touchscreen control, you do get GPS instead. The D5300's 600-shot battery life has since been beaten by the D5500, but it'll still outlast a Canon EOS Rebel T6i / 750D. All in all, it may not be the latest entry-level DSLR, but the D5300 is still a smart buy. The new Alpha A7 III is one of our favorite cameras rights now, packing in a great performance for a brilliant price. If your budget can't stretch to it though, the Alpha A7 II is still worth a look as in some cases, it's half the price of its newer sibling. It might not have all the latest features, but you still get a very good 24.3MP full-frame sensor, a very capable AF system and excellent image stabilization. Handling isn't quite as refined though as the newer camera, but for the incredibly tempting price, this can be overlooked. You'll be hard pressed to find a better camera for your money. That is unless you want something even cheaper in the shape of the original Alpha A7. The PowerShot SX710 HS is appealing to both absolute beginners and to those with a little more experience of photography. On the back is a small mode dial which enables you to quickly switch between different exposure modes, including full manual and semi-automatic modes for those who want to take control, plus fully automatic and scene modes. The 30x optical zoom covers an excellent range of focal lengths and gives plenty of flexibility for the average holiday shooter. There's no touchscreen however, but you can't really complain at the price. A nicely capable camera for those who just want a point and shoot compact with a long focal length zoom range. This might be one of the oldest models here – five years old, in fact – but you can still grab it new and it's still the cheapest way to enter the world of full-frame shooting. Where else will you find a full-frame camera and a lens for under four figures? Sure, it might not sing and dance like the A7 II and A7 III can, but if you don't need 4K video, touchscreen control or the very latest autofocus system, it's a steal. The core of it – namely a 24.3MP full-frame sensor, hybrid AF system, 5fps burst shooting mode, 1.23million dot LCD and Wi-Fi with NFC – is still strong by today's standards, and you can take advantage of all the many lenses Sony and third parties have released since then. If you want full-frame shooting for an APS-C price tag, this is the camera for you. Despite it being one of the cheapest bridge cameras available, you still get a lot of camera for your cash with the Panasonic Lumix FZ70 (known as the FZ72 outside the US). Let's start with the lens. The Lumix FZ70 packs in a staggering 60x optical zoom, running from an impressively ultra-wide 20mm-equivalent to 1200mm, so you won't have any excuses for not filling the frame. You also have the option of full manual control (as well as a host of helpful auto modes), raw format shooting, and decent image quality from a sensor this size. Downsides? While there is an EVF, it's not the best quality, and there's no touchscreen functionality or wireless connectivity.